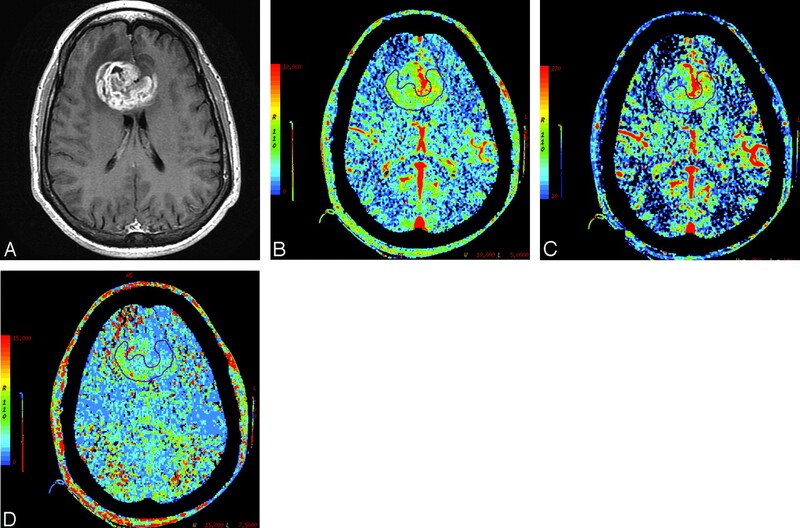 BACKGROUND AND PURPOSE: Perfusion imaging using CT can provide additional information about tumor vascularity and angiogenesis for characterizing gliomas. The purpose of our study was to demonstrate the usefulness of various perfusion CT (PCT) parameters in assessing the grade of treatment-naïve gliomas and also to compare it with conventional MR imaging features. MATERIALS AND METHODS: PCT was performed in 19 patients with glioma (14 high-grade gliomas and 5 low-grade gliomas). Normalized ratios of the PCT parameters (normalized cerebral blood volume [nCBV], normalized cerebral blood flow [nCBF], normalized mean transit time [nMTT]) were used for final analysis. Conventional MR imaging features of these tumors were assessed separately and compared with PCT parameters. Low- and high-grade gliomas were compared by using the nonparametric Wilcoxon 2-sample tests. RESULTS: Mean nCBV in the high- and low-grade gliomas was 3.06 ± 1.35 and 1.44 ± 0.42, respectively, with a statistically significant difference between the 2 groups (P = .005). Mean nCBF for the high- and low-grade gliomas was 3.03 ± 2.16 and 1.16 ± 0.36, respectively, with a statistically significant difference between the 2 groups (P = .045). Cut points of >1.92 for nCBV (85.7% sensitivity and 100% specificity), >1.48 for nCBF (71.4% sensitivity and 100% specificity), and <1.94 for nMTT (92.9% sensitivity and 40% specificity) were found to identify the high-grade gliomas. nCBV was the single best parameter; however, using either nCBV of >1.92 or nCBF of >1.48 improved the sensitivity and specificity to 92.9% and 100%, respectively. The sensitivity and specificity for diagnosing a high-grade glioma with conventional MR imaging were 85.7% and 60%, respectively. CONCLUSIONS: PCT can be used for preoperative grading of gliomas and can provide valuable complementary information about tumor hemodynamics, not available with conventional imaging techniques. nCBV was the single best parameter correlating with glioma grades, though using nCBF when nCBV was <1.92 improved the sensitivity. An nCBV threshold of >1.92 was found to identify the high-grade gliomas. Gliomas, the most common primary brain neoplasms in adults, are very heterogeneous tumors. High-grade gliomas can be highly invasive and extremely vascular tumors. Glioma grading is currently based on the histopathologic assessment of the tumor, which is achieved by stereotactic brain biopsy or cytoreductive surgery; and there are inherent limitations with these techniques and their interpretation.1 Therapeutic approaches, response to therapy, and prognosis depend on accurate grading, and thus finding the part of the tumor with the highest grade to be biopsied is critical. Malignant brain tumors are characterized by neovascularity and increased angiogenic activity, with a higher proportion of immature and hyperpermeable vessels.5,6 Because vascular proliferation is an important characteristic in the grading of astrocytomas,7 imaging techniques that provide hemodynamic information about the tumor may help in characterizing glioma malignancy, which may overcome some of the limitations of histopathologic sampling error and conventional MR imaging. 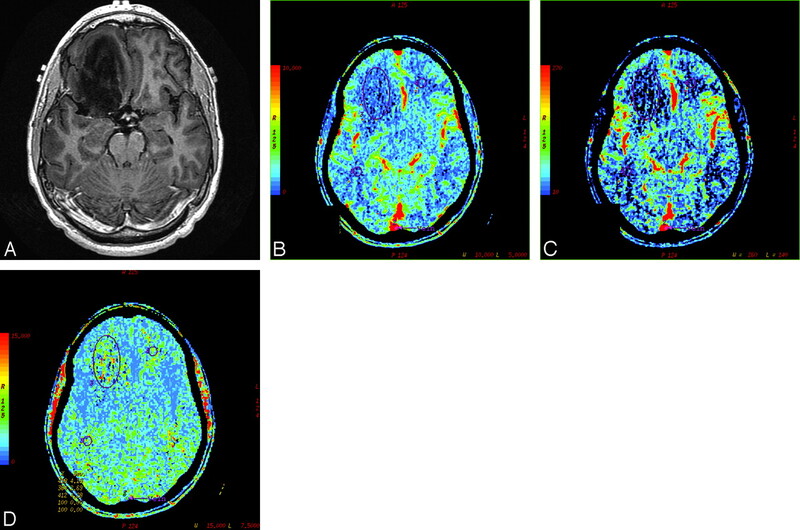 Perfusion imaging has been useful in grading cerebral neoplasms8–14 and may provide reliable information on tumor physiology such as microvascularity, angiogenesis, micronecrosis, and cellularity. The purpose of our study was to demonstrate the usefulness of various PCT parameters such as cerebral blood volume (CBV), cerebral blood flow (CBF), and MTT in assessing the grade of treatment-naïve gliomas and also to compare them with conventional MR features. Our institutional review board approved this prospective study, and an informed consent was obtained from each participant before the study. The study group consisted of 19 patients, 11 men and 8 women, ranging in age from 18–69 years (mean age, 46.4 years) with treatment-naïve brain tumors, of which 5 were biopsy-proved low-grade gliomas (World Health Organization [WHO] grade I, n = 1 and grade II, n = 4), and 14 had high-grade gliomas (WHO grade III, n = 6 and grade IV, n = 8). We did not have any pilocytic astrocytomas in the low-grade group. Histopathologic evaluation was based on the WHO system; grade I and II, low-grade glioma; grade III, anaplastic glioma; and grade IV, glioblastoma multiforme (GBM). All patients underwent PCT before any treatment. Cytoreductive surgery (subtotal resection in 16 patients and gross total resection in 1 patient) was performed in 17 patients, and histopathologic diagnosis in this subset of patients was obtained from surgical specimens. Two patients underwent stereotactic biopsy without surgical resection of the tumor. The tumor area ranged from 2.06 to 61.08 cm2 (mean, 21.95 cm2) measured on postcontrast T1-weighted MR images. The tumor area for the nonenhancing tumors was measured by using the area of T1 hypointensity on the postcontrast scans. Imaging was performed with a 3T unit (Signa Excite HD; GE Healthcare, Milwaukee, Wis). A localizing sagittal T1-weighted image (3196/6 [TR/TE]) was obtained, followed by nonenhanced axial T1-weighted (3000/6 [TR/TE]), axial fluid-attenuated inversion recovery (10 002/120/2550 [TR/TE/TI]), and T2-weighted (3000/103[TR/TE]) images. Contrast-enhanced axial T1-weighted imaging was also performed (3000/6 [TR/TE]). One experienced neuroradiologist (S.C.P), blinded to the PCT results, reviewed the conventional MR images and graded each tumor according to the 2-tier imaging grading system: low- versus high-grade gliomas. Grading of tumors on conventional MR imaging was based on 8 criteria: contrast material enhancement, mass effect, signal-intensity heterogeneity, hemorrhage, necrosis, degree of edema, involvement of the corpus callosum, and crossing of the midline.17,18 The degree of vasogenic edema was further subclassified as 1+ (mild edema), 2+ (moderate edema), and 3+ (severe edema). Patient demographics and conventional MR imaging findings are included in Table 1. Perfusion studies were performed with a 16-section multidetector row CT scanner (LightSpeed; GE Healthcare). The most recent MR imaging studies of the patient were reviewed before the perfusion study. A noncontrast CT head scan was obtained to localize the region of interest before obtaining a perfusion scan. For the perfusion scan, 50 mL of nonionic contrast (300 mg I/mL) was injected at a rate of 4 mL/s through a 20-gauge intravenous line. At 5 seconds into the injection, a cine (continuous) scan was initiated with the following technique: 80 kVp, 190–200 mA, 4 × 5 mm sections, and 1 second per rotation for a duration of 50 seconds. The 1-second images were reformatted at 0.5-second intervals, and the 5-mm sections were reformatted into two 10-mm-thick sections. Perfusion maps of CBV, CBF, and MTT were generated at an Advantage Windows workstation by using the PCT 3.0 software (GE Healthcare) in all patients. We used the superior sagittal sinus as the venous output function in all patients and the artery with the greatest peak and slope on time-attenuation curves as the arterial input function. The contralateral anterior cerebral artery as the arterial input function was used in 17 patients, and the contralateral middle cerebral artery was used in 1 patient for generation of the perfusion maps. All patients tolerated PCT without any adverse reactions to the rapid-bolus injection of contrast. In the quantitative assessment, manually drawn regions of interest were placed in the tumor, and the absolute perfusion parameter values were recorded. 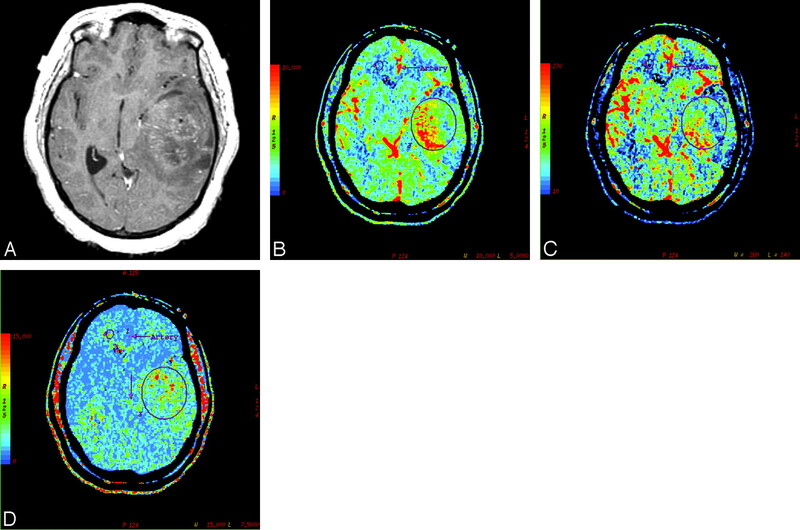 CBV, CBF, and MTT were normalized (nCBV, nCBF, nMTT) by dividing tumor absolute perfusion parameter values by values obtained from the normal-appearing white matter of the contralateral cerebral hemisphere as far away from the primary neoplasm as possible. We placed the regions of interest in the solid portion of the tumor, taking care to avoid necrosis or areas of cystic degeneration (Figs 1–3). A, Postcontrast T1-weighted axial image in a 46-year-old man with WHO grade IV glioma showing a markedly enhancing bifrontal necrotic tumor with involvement of the genu of the corpus callosum and surrounding perilesional white matter edema. B, PCT CBV map showing elevated blood volume (nCBV = 4.3). C, CBF map showing elevated blood flow (nCBF = 6.27). D, MTT map showing decreased MTT (nMTT = 0.63) within the tumor. WHO grade III glioma in a 39-year-old woman. A, Postcontrast T1-weighted axial image showing a large heterogeneously enhancing left temporal mass lesion with significant mass effect. B, Corresponding CBV map showing elevated blood volume (nCBV = 2.61). C, CBF map showing increased blood flow (nCBF = 1.65). D, MTT map showing decreased MTT (nMTT = 1.68) within the tumor. Also note the mismatch between areas of increased blood volume/blood flow on the CBV/CBF maps and the areas of gadolinium enhancement. A 34-year-old man with WHO grade II glioma. A, Postcontrast T1-weighted axial image showing a nonenhancing mass in the right frontal lobe. B, CBV map showing low blood volume (nCBV = 0.94). C, CBF map showing decreased blood flow (nCBF = 1.26). D, MTT map showing increased transit time (nMTT = 1.07) within the tumor. Low- and high-grade tumors were compared by using the nonparametric Wilcoxon 2-sample test. This test is similar to the Student 2-sample t test but does not require the assumption of equal variability between the 2 groups. Receiver operating characteristic analysis curves for each perfusion parameter were computed to identify the cut points that maximized the sum of sensitivity and specificity. In this analysis, “sensitivity” was defined as the proportion of correctly identified high-grade tumors, and “specificity” was defined as the proportion of correctly identified low-grade tumors. Fourteen of the 19 patients had high-grade gliomas, and 5 had low-grade gliomas. Table 1 summarizes the findings of the morphologic MR imaging features in all the 19 patients. All except 2 of the high-grade gliomas and 3 of the low-grade gliomas showed contrast enhancement. All GBMs in the high-grade group showed necrosis. Of the high-grade gliomas, 5 had hemorrhage, and none of the low-grade gliomas showed foci of hemorrhage. Multifocal tumors with distant areas of tumor foci were observed in 2 of the high-grade gliomas. The extent of peritumoral T2 abnormality was greater in high-grade gliomas. The sensitivity, specificity, positive predictive value, and negative predictive value for grading gliomas with conventional MR imaging were 85.7%, 60%, 85.7%, and 60%, respectively. The nCBV in the high-grade gliomas ranged from 1.12 to 5.39 (mean, 3.06; SD, 1.35), whereas in the low-grade gliomas, it ranged from 0.94 to 1.92 (mean, 1.44; SD, 0.42) (Table 2). The nCBF in the high-grade gliomas ranged from 0.78 to 6.84 (mean, 3.03; SD, 2.16), whereas in the low-grade gliomas, it ranged from 0.58 to 1.48 (mean, 1.16; SD, 0.36). The nMTT in the high-grade gliomas ranged from 0.63 to 2.63 (mean, 1.29; SD, 0.55), whereas in the low-grade gliomas, it ranged from 0.83 to 3.55 (mean, 1.69; SD, 1.12). The difference in nCBV and nCBF between the 2 groups was statistically significant (P = .005 and P = .045, respectively), with patients with low-grade tumors having a lower mean nCBV and nCBF than patients with high-grade tumors. No statistically significant difference was observed between the 2 groups for nMTT (P = .559); however, the trend was for lower nMTT in high-grade gliomas. For nCBV, the cut point of >1.92 was selected to identify high-grade tumors (85.7% sensitivity and 100% specificity) (Fig 4). For nCBF, the cut point of >1.48 was selected to identify high-grade tumors (71.4% sensitivity and 100% specificity) (Fig 5). 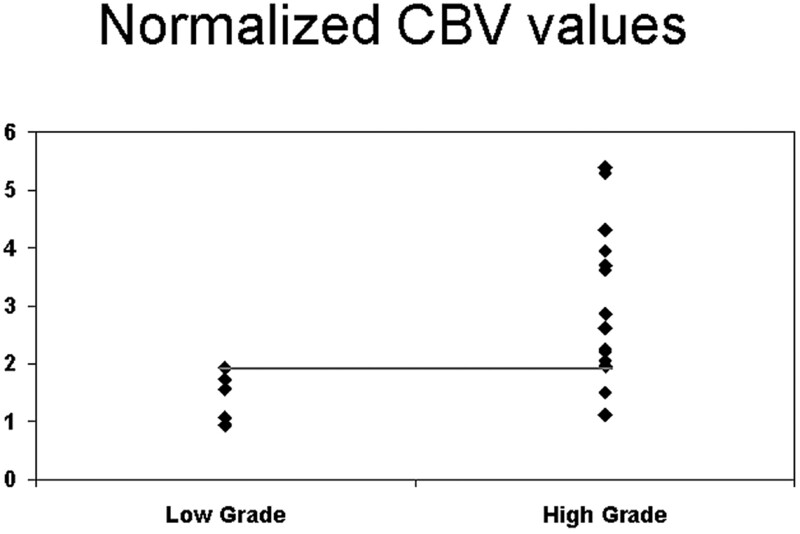 Scatter plot for nCBV versus grade of tumor showing the threshold to differentiate low- from high-grade tumors. Scatter plot for nCBF versus grade of tumor showing the threshold to differentiate low- from high-grade tumors. The cut point selected for nMTT was <1.94 for high-grade tumors (92.9% sensitivity and 40% specificity) (Fig 6). Table 3 shows the results of the sensitivity/specificity analyses. The high-grade gliomas were divided into 2 groups (grade III and grade IV), and pairwise comparisons were performed between the low-grade and high-grade tumors and also between the 2 subgroups of the high-grade gliomas for differences in nCBV, nCBF, and nMTT. The differences in nCBV between low-versus-grade III and low-versus-grade IV gliomas were statistically significant (P = .03 and P = .01, respectively); however, there was no statistically significant difference between grade III and grade IV (P > .05). 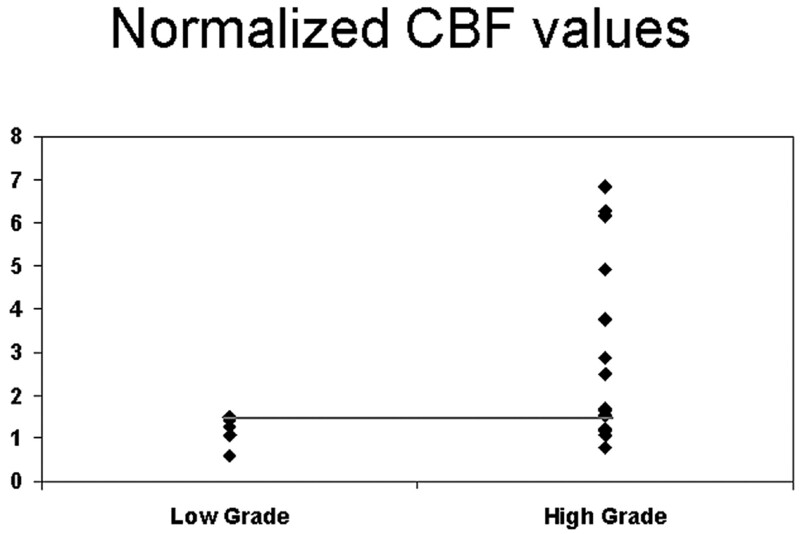 In addition, the difference between low-grade and grade IV for nCBF was also significant (P = .048). No other differences between tumor groups for nCBF or nMTT were observed (P > .05) (Table 2). 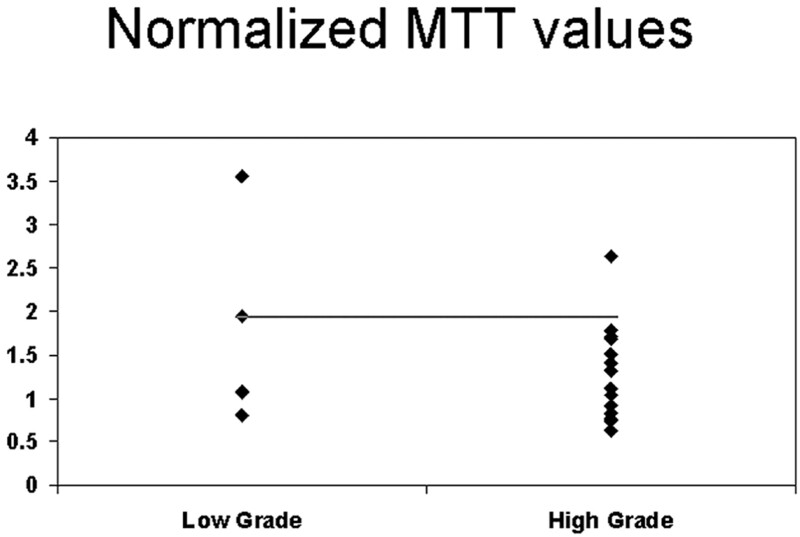 Scatter plot for nMTT versus grade of tumor showing the threshold to differentiate low- from high-grade tumors. Conventional MR imaging provides important anatomic information; however, it is insufficient in determining the grade of the tumors preoperatively.17 Contrast enhancement on MR imaging depicts areas of breakdown of blood-brain barrier,28 which is often associated with higher tumor grade; however, contrast enhancement is not always accurate in predicting the tumor grade.8,29–32 Even in the high-grade gliomas with pathologic contrast enhancement, the enhancement may not reflect the areas of neovascularity and angiogenesis.33,34 Thus radiologic grading of tumors with conventional MR imaging is not always accurate, with sensitivity in identifying high-grade gliomas ranging from 55.1% to 83.3% in various studies8,14,17,18,31 and 85.7% in our study. Finally, conventional MR imaging does not provide information on tumor physiology, which is also an important factor in determining the tumor grade. Perfusion imaging of brain tumors, which has mostly used various MR perfusion techniques, can also be used for stereotactic biopsy guidance,11 better delineation of tumor margins,9,38and also for assessing treatment response.15,46 PCT shares the advantages of MR perfusion and potentially has advantages over MR perfusion because of easy accessibility, measurement of absolute perfusion values, and relatively easy postprocessing. In addition, there are some important limitations associated with MR perfusion: 1) The technique is susceptibility-weighted. It is extremely sensitive to magnetic field inhomogeneity, and thus hemorrhagic products can complicate the analysis. 2) The cost of imaging hardware can be high because perfusion MR imaging requires high-performance gradients and very fast echo-planar imaging sequences. 3) Calculation of rCBV can be inaccurate in lesions such as GBM or meningioma, where there is a severe breakdown or absence of the blood-brain barrier.47 4) Perfusion measurements are relative rather than absolute values. However, limitations of PCT include the radiation dose involved with the procedure and the limited coverage area compared with MR perfusion. Previous studies using MR perfusion have described various rCBV threshold values. Lev and Rosen11 described a threshold of 1.5 in discriminating between patients with low- and high-grade gliomas, with a sensitivity and specificity of 100% and 69%, respectively. Law et al14 showed a sensitivity and specificity of 95.0% and 57.5%, respectively, by using 1.75 as the threshold value. Shin et al12 used a threshold of 2.93, with a sensitivity of 90.9% and a specificity of 83.3%. Hakyemez et al48 used a threshold of 2.00 to differentiate low- and high-grade gliomas, with 100% sensitivity and 90.9% specificity. Using an nCBV of >1.92 (sensitivity of 85.7% and specificity of 100%), we were able to identify all the low-grade tumors, but 2 of the high-grade tumors were misclassified (nCBV of 1.5 and 1.12). Using either an nCBV of >1.92 or an nCBF of >1.48, PCT misclassified only 1 case, which was misclassified on MR imaging too, thus slightly improving the sensitivity of PCT to 92.9%, and the specificity remained 100%. This sensitivity and specificity of PCT appear to be better than those defined by previous studies. In this study, conventional MR imaging misclassified 4 cases (low-grade glioma, n = 2 and high-grade glioma, n = 2), of which both the low-grade gliomas and 1 high-grade glioma were correctly classified with PCT. One high-grade glioma, which was misclassified by both PCT and conventional MR imaging, was a diffuse tumor involving both the cerebral hemispheres, and the low nCBV values can be explained by intermingling of the tumor cells with the normal neurons and white matter tracts, leading to the lower observed values. Another interesting finding in our study was the mismatch between the areas of contrast enhancement and areas of high CBV on the perfusion maps in 4 patients. This is not surprising because areas of contrast enhancement are caused by alteration or break in the blood-brain barrier with or without vascular hyperplasia, whereas perfusion abnormality reflects the degree of tumor vascularity and tumor angiogenesis. Limitations of our study include the following: 1) the small number of patients, especially those with the low-grade gliomas; 2) the questionable reproducibility of the absolute values and variation in the absolute values of the PCT parameters obtained by using a different arterial input and venous output function for which we tried to compensate by using normalized ratios, normalized to the normal white matter rather than by using the absolute values; 3) One-to-one correlation between histologic specimen and abnormality seen on perfusion images or conventional MR images was not done. PCT can be used for preoperative grading of gliomas. Because there may be an error in classifying these tumors on the basis of morphologic MR imaging features alone, PCT can provide complementary information about tumor vascularity of gliomas, which can be useful in predicting prognosis and tumor response to various antiangiogenesis therapies. nCBV was the single best parameter correlating with glioma grades, though using nCBF when nCBV was <1.92 slightly improved the sensitivity in diagnosing high-grade gliomas. PCT maps can also be very useful for surgical biopsy and/or radiosurgery guidance to target the areas of increased CBV, with a better histologic yield and better response to treatment. The sensitivity and specificity of PCT in tumor grading are not currently matched by any other imaging technique. These data may justify the more routine use of this technique in the assessment and follow-up of patients with gliomas.